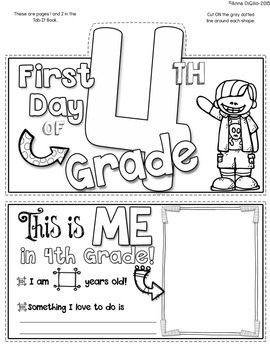 Are you looking for a FUN, EASY, No-Prep Activity for the First Day of Fourth Grade? If so, LOOK NO FURTHER! 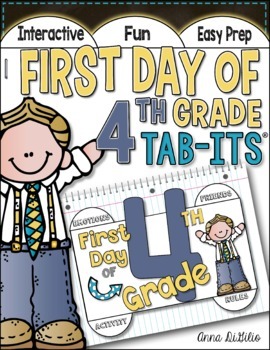 This First Day of 4th Grade Tab-Its Booklet® is the PERFECT activity to help your students get to know one another, think and reflect on the classroom rules, do a bit of word work, and get some first day writing in! What more could you want on the First Day of School?! This Tab-It Booklet® has a total of 6 pages including the cover page. 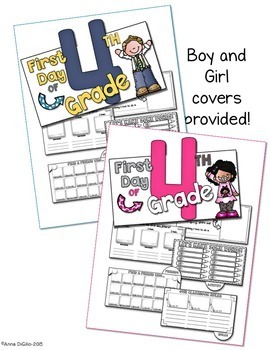 There is a BOY and GIRL cover page option. This Tab-It Booklet® fits perfectly inside of a spiral bound or black and white composition notebook OR you can hang it on your Back to School Bulletin Board display for a great looking board!